The CGOA 2010 Design Competition needs your creativity. Here’s a chance for the Guild membership to show the world the best of what crochet can do. Whether you are a published or professional designer, a talented amateur hobbyist, or a total crochet-a-holic, you are invited to enter your most amazing original creations for consideration. Judging will take place on Thursday evening, July 8th, at the gala Awards Ceremony during the CGOA 2010 Conference in Manchester, NH. You don’t have to be there to win, but you’ll definitely want to be part of the excitement and see the eye-popping display of entries. Thanks to generous grants from our sponsors, including Coats & Clark, Caron International, Boye Needle, DRG Crochet! Magazine, and Interweave Crochet, we have thousands of dollars to be awarded: one grand prize of $1,000 plus, in each of six judging categories, $300 first prize, $200 second prize, $100 third prize, and special awards to be announced. --Thread Crochet, any design made in any super-fine weight thread material, generally using tiny gauge and steel crochet hooks. The competition is open to CGOA members only. All entries must be original designs. All crochet techniques are encouraged, using any materials you like. Other fiber, needle and crafting arts may be incorporated in your design, but the overall impression must be crochet. Entrants will not be required to furnish written patterns. Please see the official entry form and information package for complete rules and details. Entries must be shipped to arrive at the collection location between June 1 and June 15, 2010. So grab that hook and get to it. 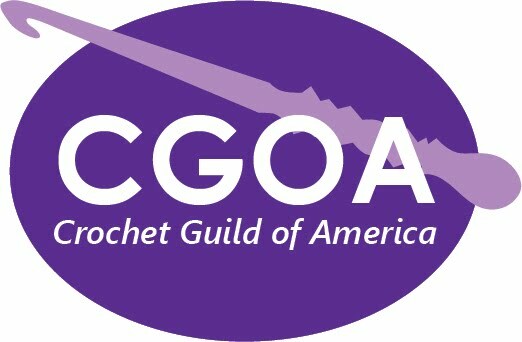 Visit the CGOA site at crochet.org to join, or log on as a member to download your entry package. Join us for an exciting crochet-along (CAL) here at CGOA Now! during March to celebrate National Crochet Month. Crochet your favorite project(s), share links to photos of your work-in-progress or finished item(s) and leave comments to share about your chosen project(s). Even if you aren't able to participate in the CAL, you are still invited to leave positive comments about what others have made. Be sure to participate in this fun event and be inspired by all the lovely items people will be crocheting! If your chapter is doing anything special for National Crochet Month, let us know! And be sure to share photos!